Not a bad few days. 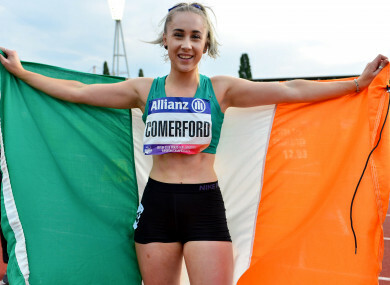 DUBLIN SPRINTER ORLA Comerford has added to both Ireland’s and her own individual medal collection at the Para Athletic European Championships with another bronze in the T13 100m. The Raheny Shamrocks star pipped German Janne Sophie Engeleiter for a medal by just one hundredth of a second and clocked a time of 12.82. On Wednesday evening, the 20-year-old took bronze in the T13 200m, behind Ukraine’s Leilia Adzhametova and Portugal’s Carolina Duarte. And this evening’s podium sees the trio in the exact same order. Comerford’s latest success brings Ireland’s medal count in Berlin to eight — Jason Smyth (two gold), Noelle Lenihan (one gold), Orla Barry (one gold) Great Streimikyte (one gold) and Jordan Lee (one bronze) are the other medalists. The only athlete yet to compete is Niamh McCarthy, who will defend her title in the F41 Discus on Sunday. Email “Comerford bags second bronze in Berlin bringing Ireland's medal count to eight”. Feedback on “Comerford bags second bronze in Berlin bringing Ireland's medal count to eight”.